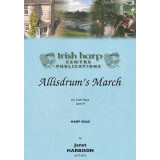 Allisdrum’s MarchHarp SoloLevel 4 - MarchFrom my ‘Ulster Epic’ telling the s.. Flying to the FleadhHarp SoloLevel 3 - Slip JigA great slip-jig composed by master Belfast uilleann ..
Johnny Sit DownHarp SoloLevel 3 - HornpipeA cheeky little hornpipe in B minor that is a lot of fun t.. Kid on the MountainHarp SoloLevel 3 - SlipJigA very old, 4 part slip-jig popular among uilleann pipe..
Mazurka Set No.1 - SoloSonny Brogan’s and Hugh Gillespie’sThe perfect combination of 2 popular mazur..
McHugh’s JigHarp SoloLevel 4 - JigThis is a great jig in Dminor that the wonderful Martin Power (Acc..
O'Neill's Cavalcade & The ChaseHarp SoloLevel 3 - MarchThe influence of the early Chieftains’ re..
Reel Set No1Humours of Tulla, Drowsy Maggie & The Glass of BeerIrish Harp - Level 4.. Sergeant Early's DreamHarp SoloLevel 4 - ReelI first played this arrangement myself in a Fleadh comp.. The Atholl Highlanders & Burke’s JigsHarp SoloLevel 3 - JigTwo great jigs I learned from fiddler.. The Belfast Hornpipe - SoloHarp SoloLevel 3 - HornpipeOne of the old-time best-known hornpipes that .. The ButterflyHarp SoloLevel 4 - Slip JigOne of the best-loved recently evolved slip-jigs. The .. The Harvest HomeHarp SoloLevel 4 - HornpipeAnother of the ‘olden goldie’ hornpipes that was composed.. The Monaghan JigHarp SoloLevel - Level 3One of the great 4 part old, traditional jig tunes that is p.. The Rectory ReelHarp SoloLevel 4 - ReelAnother great tune from piper Patrick Davey when he was teach..